June 12th, 2013, Toronto - This is an updated and expanded edition of the popular post, Advanced Community Management in Media Factory 3 that discusses some of the features and applications now available in Media Factory 4. With the addition of the groups and assignments features, community management has become even more powerful in Media Factory 4. In order to appreciate how groups can work for your projects, it makes sense to understand some of the basics of the system first. Collections (saved search and manual) are basic playlist objects that can contain media. Saved searches are dynamic based on parameters (ex. 10 highest rated) and manual collections are completely editorial. Collections are playlists meant for the presentation of media. Channels are used to organize types of media such as uploads, comments, avatars, group logos and check-ins. Channels can have rules such as geo-fencing, visibility and moderation email templates. A media file can only exist in one channel at a time. Nesting is generally used for subsets such as separating language-based uploads. Groups are used to organize media and members into flexible, customized containers. They are searchable, support custom meta-data and can be manually ordered for display. Media and members can be placed in multiple groups. 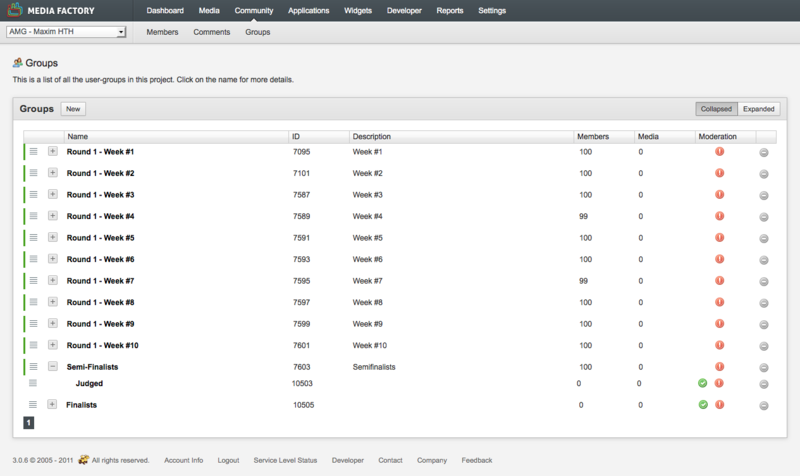 Groups can also be owned and modified by end-user members, enabling social features such as discussion groups. Groups can be of various types: group, assignment or event - with more types coming in the future. Group: A standard group should be used primarily as an informational structure element, like a folder. Groups should only contain other groups, assignments or events. Assignment: Users should be encouraged to upload content into assignments. They should be contained in an organizational group and should be terminal, ie. they should have no child elements. A common application is in our white-label Citizen Journalism application: the homepage of the app lists only assignments, sorted by distance from your current location. In Media Factory, assignments are organized into a logical hierarchy for management purposes. Event: Very similar to the application of an assignment, events are typically terminal nodes that contain media but more importantly members - people attending that event. Contest: coming soon.. This group type will allow producers to quickly launch and manage contests within the larger community. Includes business rules such as phases and voting rules. Notification Centre is where Media Factory users can create and send push notifications to native mobile applications. Groups play an important role in determining whom shall receive a push notification and to what page in the application the user is sent when opening the notification. After specifying the name and body of the notification, the producer selects a base page for the target of the opened notification. For some base pages, such as the home page of the app, this is sufficient. For others, the producer must also specify a sub page. For example, the producer has created an assignment and wants to tell everyone about it and send them directly to that page in the application. The producer first selects Group/Assignment as the base page. Then from the dropdown that appears below, the producer may select the assignment sub page from the group tree they created. The second part is determining whom should receive the notification. 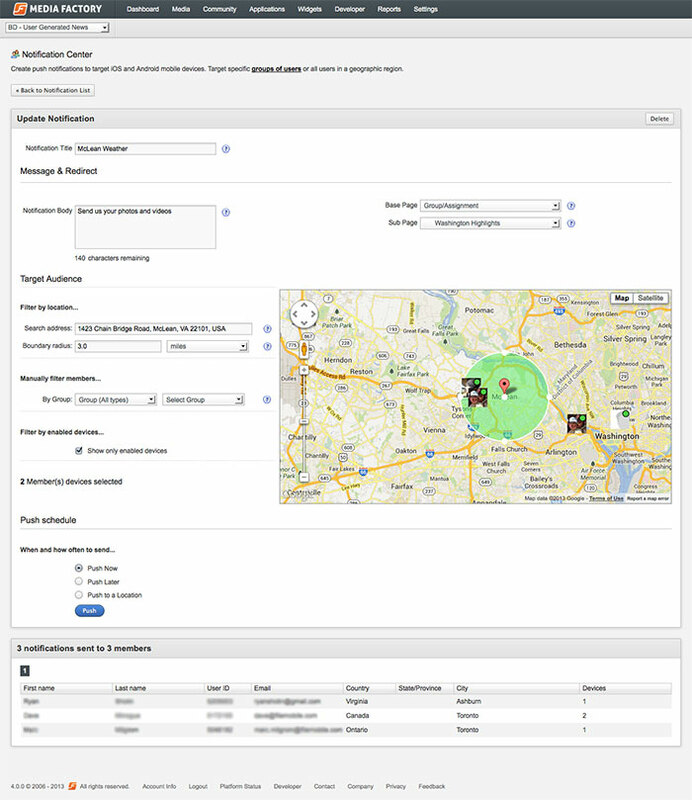 By default every mobile device with location tracking and notifications enabled are shown on the map and selected to notified. The actual number of members selected is indicated at the bottom of this section. There are several ways to filter this list of member devices. The first way is geographically. A producer can easily create a boundary area by specifying a centre point and radius. The second method is by group. The producer can simply select a group from the drop down in the Manually filter members... section. In both cases, the number of member devices to be notified will be updated immediately. 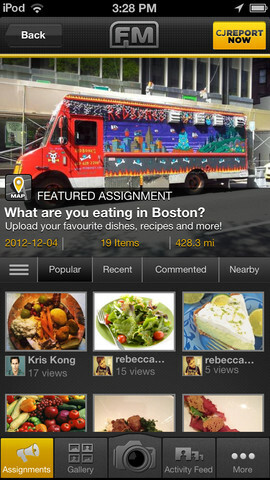 Assignments are at the center of Filemobile's native mobile applications. The architecture mirrors the companion websites and enables users to browse and submit content. Using the Notification Center, users are notified of an assignment - a specific call-to-action - and are immediately directed to upload the right content to the right place. A great example might be to create a group of preferred 'superusers' and notify them exclusively of an important event in their area. CBC used Media Factory to collect stories from users across canada and organized the stories (text, audio, video and images) into various curated groups. Since content is aware of its group membership, everything from map pins to story pages could be customized based its category. A community of questions and answers is a good example of using groups in the most basic way. 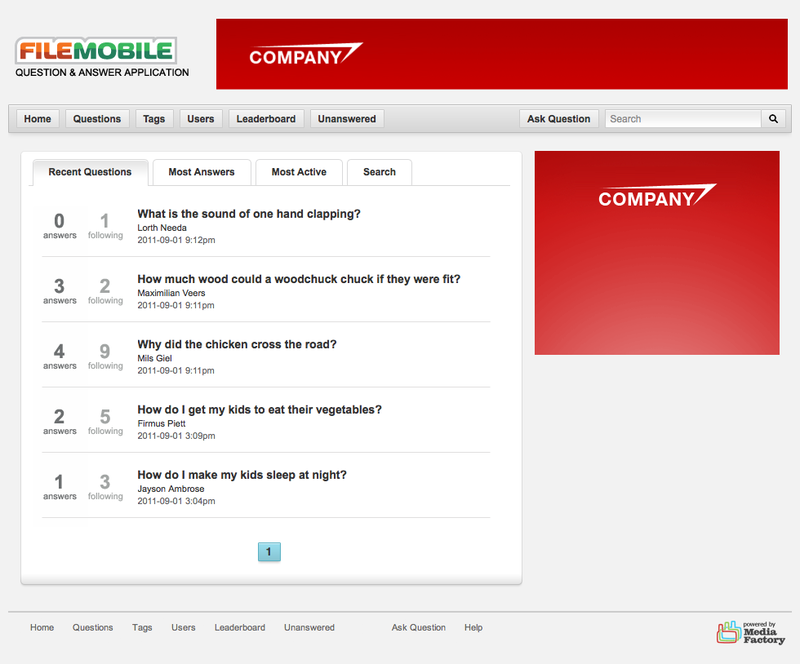 In this example, a user could choose to create a new question and have other community members answer it. Joining a group is analogous to "following" the discussion or becoming a "fan" of the group. If a user registers and posts an answer to the question, that user becomes a member of the group and will receive email updates when other answers are posted. Since each answer is a media file, it can be voted up or down or commented on, creating deeper discussions and the best answers rising to the top. Since group membership, uploads (answers) and comments are recorded, a user's profile page can list all Q&A threads they are following and how many questions they have answered. Developers can quickly produce a list of questions with the most answers, most recently posted questions, users with the most answers posted and more. We created groups which allowed Maxim editors to organize contestants into each round of the competition, some into multiple rounds. Each group also contained the images and videos for that round. Our product development team is continuing to innovate in the user-generated content management space. The Media Factory platform is a flexible and powerful solution for your unique and complex environment.